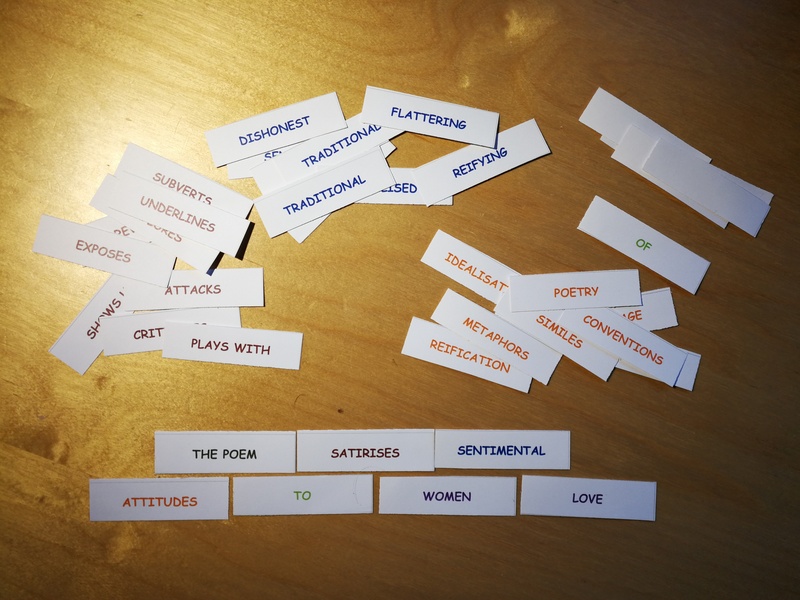 The basic idea is familiar – to practise summing up the ‘essence’ of each poem, so that students feel that they have a pinned-down overview of each – a handy encapsulation. 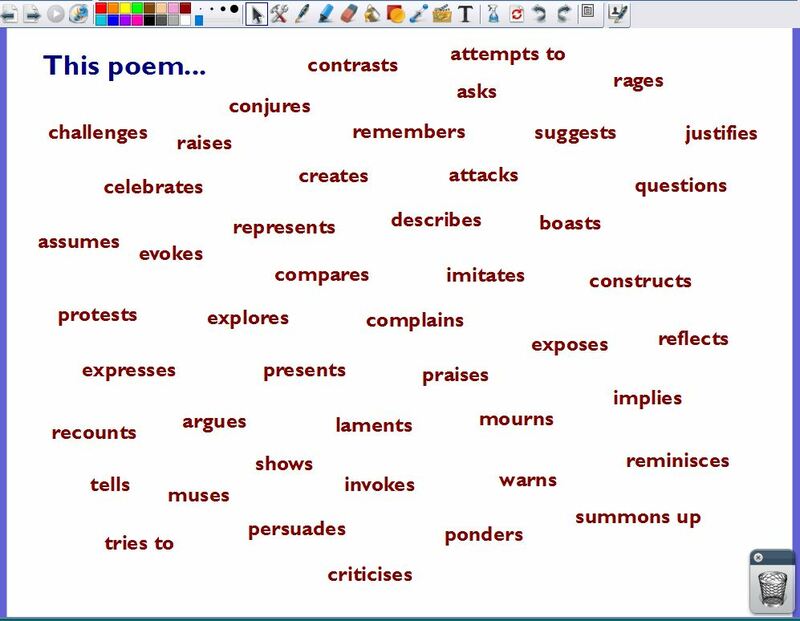 This can be useful when introducing an answer; it can be helpful for unlocking or framing ideas; and – perhaps most importantly – it can give students a sense of control, of in some way ‘owning’ each poem, when it’s tucked up in a single, illuminating sentence. The key here, though, is that the starting point is not what the poem is ‘about’ or what the poem is ‘like’. The question is ‘What does the poem do?’ Not the poet, but the poem. In other words, it is about exploring the agency of poetry, or of poetic language. The process starts, of course, with modelling from the front. 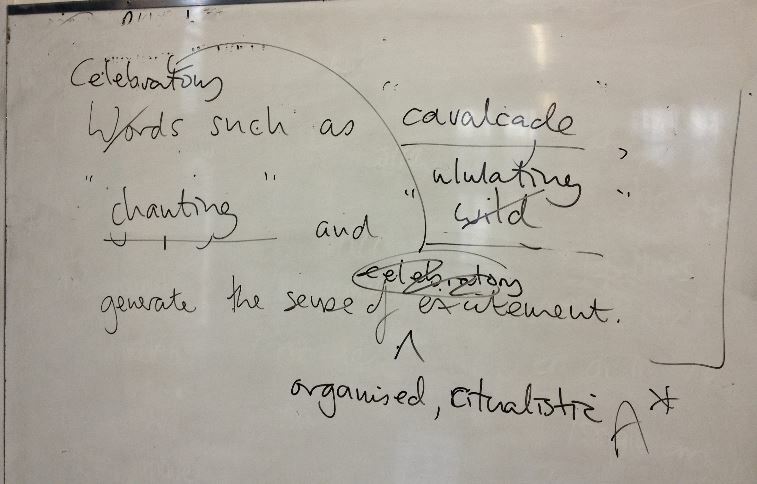 This was a class working on Sonnet 130, constructing sentences on the whiteboard. 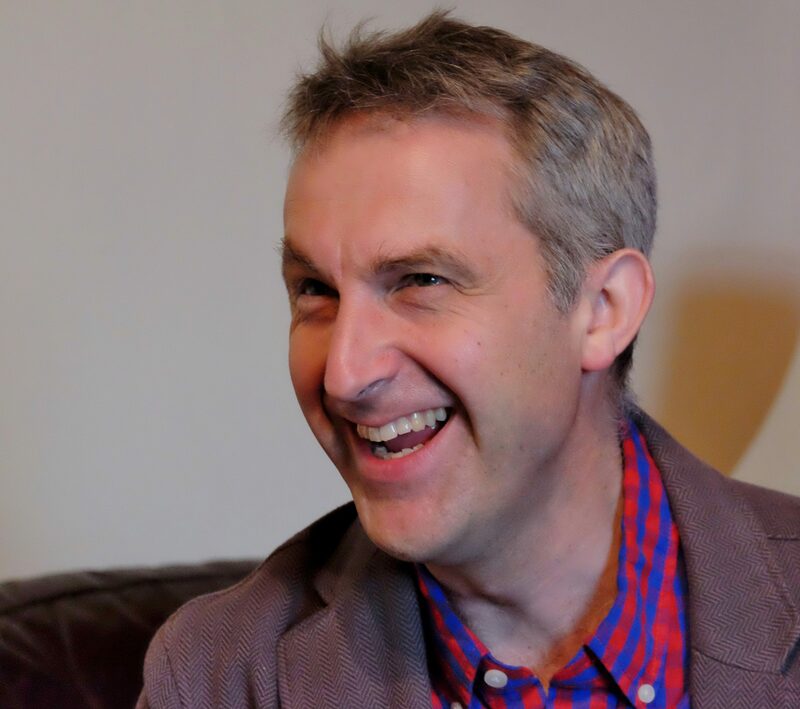 The drag-and-drop element here is helpful: it takes away the need at this stage to come up with the words; more importantly, it emphasises that this is about multiple possibilities – about selection and experimentation. It encourages disagreement and focuses debate. 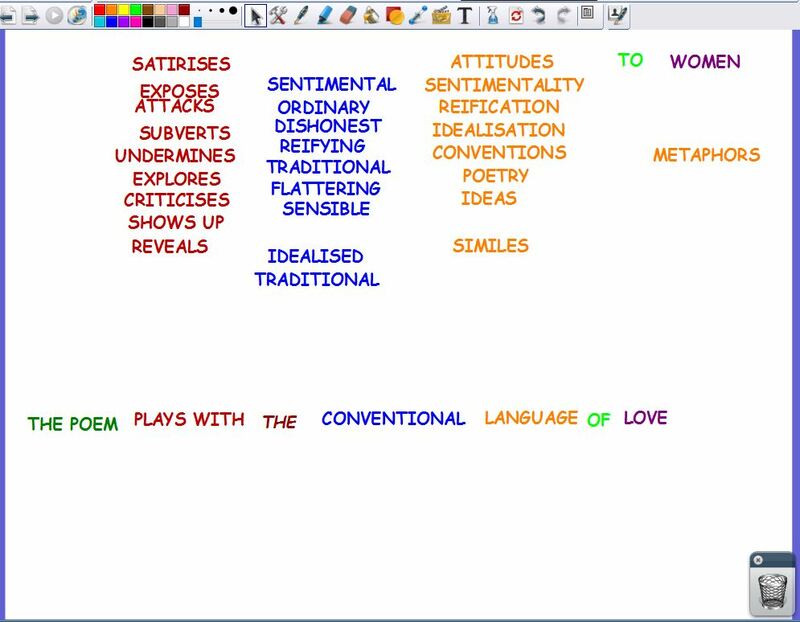 And it makes visual the fact that – whatever sentence you end up with – this is only a provisional way of looking at the poem. It is not definitive. 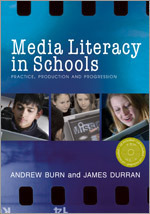 It is also an opportunity to revise higher-level vocabulary and to teach new knowledge – always a good idea at the revision stage – by introducing and explaining some unfamiliar vocabulary. For example, I don’t think I’d talked about ‘reification’ before this. Ideally, this whole class modelling is mixed up with some pair-work – with table-top experimentation. 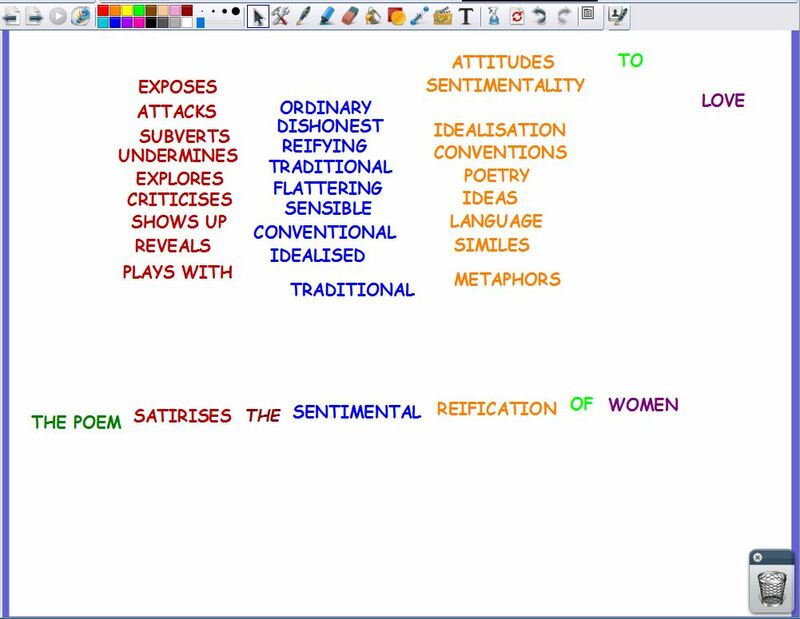 All this leads, of course, to students constructing their own sentences for all of the poems they have studied. A fun activity is selecting a verb at random and trying to make it fit. What does this poem ‘boast’? What does it ‘ponder’? What does it ‘assume’? How does it ‘protest’? And so on. This is all good for injecting some new challenge at the revision stage – for stretching students’ thinking in new directions, at a stage when the pressure of exam-readiness can take the elasticity out of their ideas. 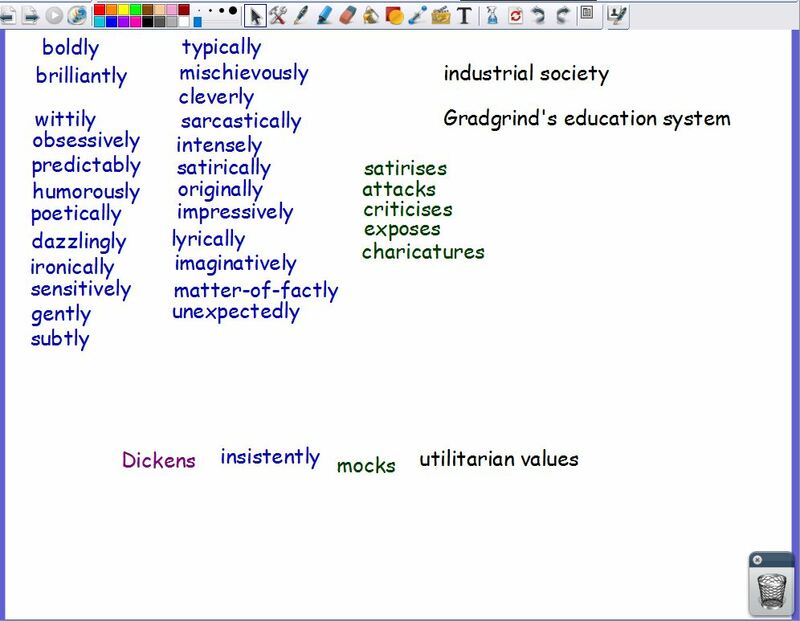 Used judiciously in analytical writing, adverbs can be transformative. 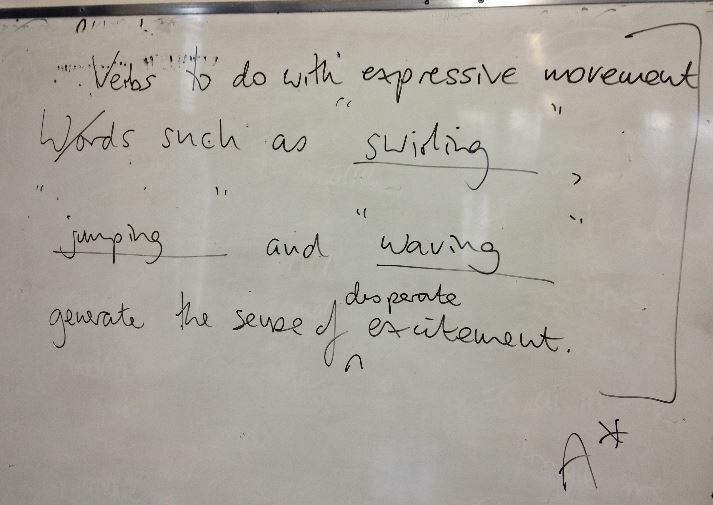 Just adding one into a sentence can lift it dramatically – implying evaluative thinking, suggesting deeper understanding, helping to create a personal voice, and so on. This is always worth practising and it is an easy add-on to the verb activity. Again, a bank of these is handy scaffolding and is, again, a way to teach some enriching ‘tier 2’ vocabulary. A good starting point is to see if students can unpick categories, like those below. 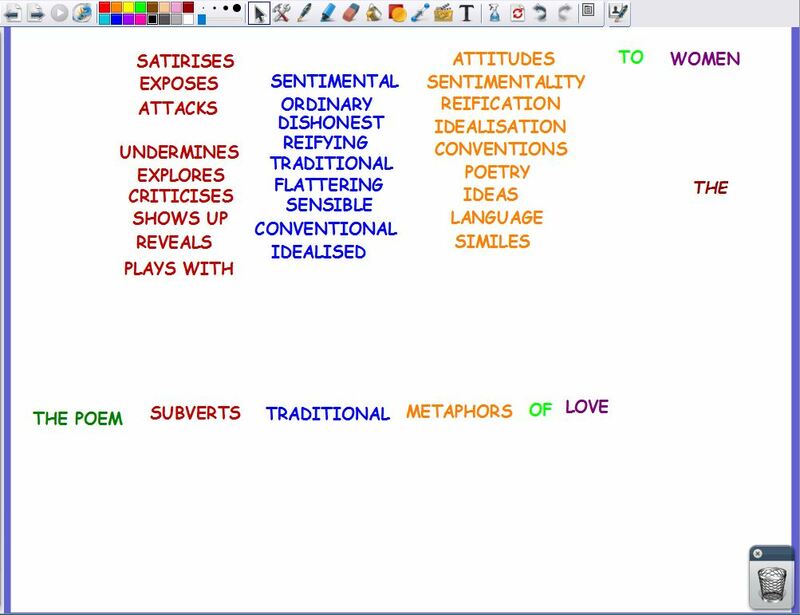 Then play with matching adverbs to poems, debating whether and how they can be applied. Then practise using them. 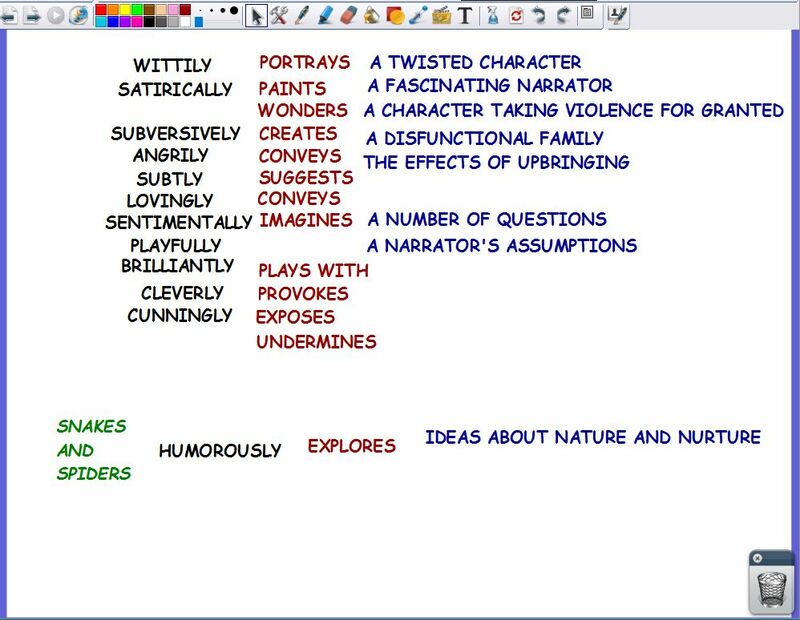 I was reminded of this when reading Chris Curtis’s very helpful posts about adding description to analysis, at learningfrommymistakesenglish.blogspot.com It also reminded me of the lesson below, where I was obviously trying hard to convince Year 11 that they could turn a ‘C’ sentence into an ‘A*’ sentence just by adding some adjectives.